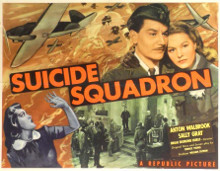 Dangerous Moonlight (US: Suicide Squadron) is a 1941 British film, directed by Brian Desmond Hurst and starring Anton Walbrook. Among the costumes, the gowns were designed by Cecil Beaton. The film is best known for its score written by Richard Addinsell, orchestrated by Roy Douglas, which includes the Warsaw Concerto.